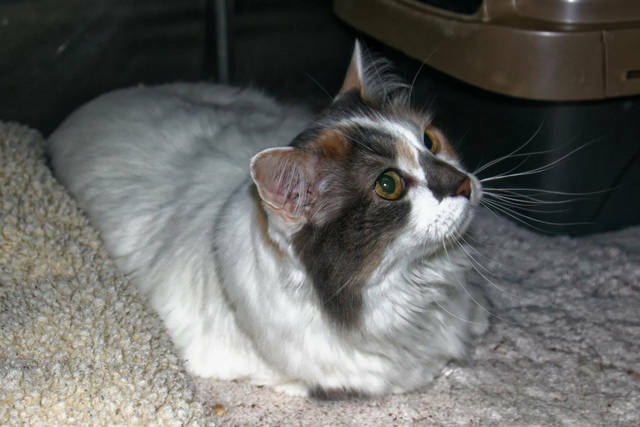 Tahlula is a 7-year-old cat that loves to be brushed and loved on. See her at PAWS Animal Shelter. Harriet is a young tabby cat that gets along well with other felines. See her at Champaign County Animal Welfare League. Meke is a four-month-old husky and yorkie mix. This adorable pup is available at Barely Used Pets. Sue Ellen is a young puppy mill rescue and is available at Champaign County Animal Welfare League. This is Tahlula. She is 7 years old and was abandoned here on our porch at the shelter. She’s fully vetted, feline leukemia negative and spayed. She’s a very sweet girl that loves to be brushed and loved on. Give her a comfy pillow and she will be your buddy for life. We run solely on donations only and always have a need for the following. Liquid laundry soap, Dryer sheets, Bleach, Dawn Dish soap, 39 gallon trash bags, hand soap, paper towels, Purina cat & kitten chow, canned cat food (pate’ chicken), cat treats, Purina dog chow, dog treats, peanut butter and monetary donations are always welcome. We are open Tues thru Fri 12 to 5 and Saturday 12 to 4 at 1535 W St Rt 36 Urbana, Oh 43078. Call us at 937-653-6233 or email at pawsurbana@hotmail.com. Stop out and see us, you’ll be glad you did! 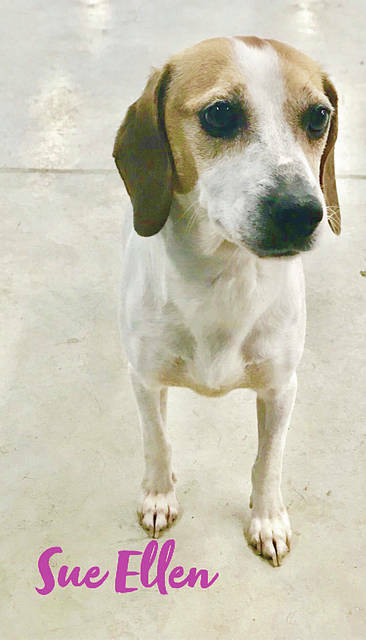 “A house is never lonely where a loving dog waits.” The Champaign County Animal Welfare League’s (CCAWL) pet of the week is Sue Ellen. She is a 3 year old, Jack Russell/Beagle mix. Sue Ellen came to us from a puppy mill where she was used for breeding purposes only. She is a social butterfly and thrives for attention. Sue Ellen is good with kids, dogs, and cats. She would need a patient owner on house training. Sue Ellen is spayed and current on all vaccinations including the following: D2PPL, Bordatella, BiValent Flu, and Rabies. She is microchipped and has been heartworm tested negative. Sue Ellen is currently on flea and heartworm prevention. If interested in Sue Ellen, you must have an approved application. The Adoption fee is $150 cash, credit or debit only. An adoption application can be found on our webpage www.champaigncoanimalwelfareleague.com. All of our residents are spayed or neutered, fully vaccinated, including the BiValent Flu vaccine, microchipped, heartworm tested, and treated with flea & heartworm prevention. The David Robert Wetzell Memorial Clinic offers low cost sterilizations. If you would like to take advantage of the $aving$ please call 937-834-5236 for details. 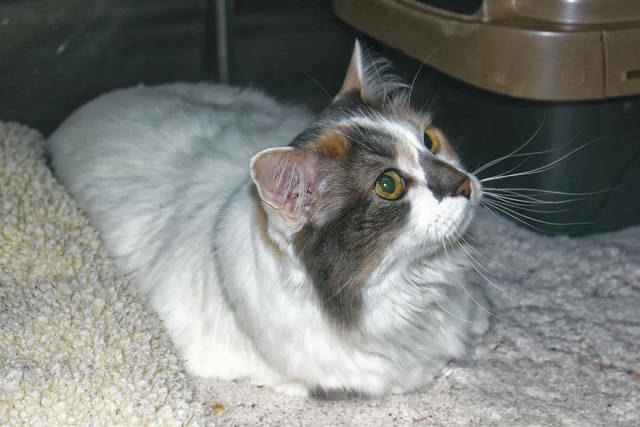 “Meow, I want to meow with you forever.” The CCAWL cat of the week is Harriet. She is a young, Medium Haired Tabby. Harriet came to us due to her owner passing. She gets along great with other cats. Harriet is looking for her furrever lap. She loves to lay on a cat tree, but also enjoys playing with her toy mice. Harriet is litter trained. She is spayed, fully vaccinated. Harriet has been FeLV/FIV tested negative. She is microchipped. The adoption fee for our cats is $50 cash, credit or debit only. Memberships are open. Please ask about becoming a member to have access to our indoor/outdoor dog park, grooming facility, agility course and trails. Hi! My name is Meke and I am a 4 month old Husky Yorkie girl. I weigh about 15 pounds and they say I have the softest coat. So they pet me A LOT and I’m thinking this is working well for me! I am up to date on my shots, worming and flea treatment. I am scheduled to be spayed. I love kids, and I am good with other dogs. I don’t even mind cats! I will need house training because I am still just a puppy girl. My adoption fee is $150 and that includes my 2018 dog license. Won’t you please come and see me? I need a forever family that I can run and play with. I have all KINDS of things on my play list so we will never run out of fun stuff to do! Could you please find a little spot in your home and your heart for me? Please visit our website: www.barelyusedpets.com. Also, like us on Facebook at Barely Used Pets Rescue (put spaces between the words). Barely Used Pets is located at 844 Jackson Hill Road in Urbana, Ohio. You can give us a call at 937-869-8090. Our regular hours are: Open Sunday 1-4 p.m., Wednesday and Thursdays 11 a.m.-6 p.m., Fridays 11 a.m.-5 p.m. and Saturday 11 a.m.-2 p.m. We are CLOSED on Monday and Tuesday. We can always use donations and they are all of those basic supplies that we use so quickly. We are in real need of lots and lots of paper towels! If you can bring us some we would surely appreciate it. https://www.urbanacitizen.com/wp-content/uploads/sites/36/2018/04/web1_Tahlula-IMG_5462_DxO.jpgTahlula is a 7-year-old cat that loves to be brushed and loved on. See her at PAWS Animal Shelter. 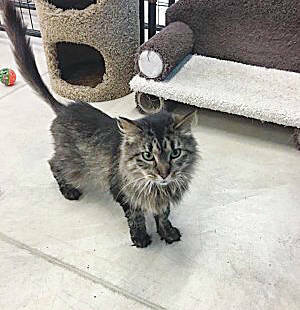 https://www.urbanacitizen.com/wp-content/uploads/sites/36/2018/04/web1_Tahlula-IMG_5462_DxOPRINT.jpgTahlula is a 7-year-old cat that loves to be brushed and loved on. See her at PAWS Animal Shelter. https://www.urbanacitizen.com/wp-content/uploads/sites/36/2018/04/web1_Harriet.jpegHarriet is a young tabby cat that gets along well with other felines. See her at Champaign County Animal Welfare League. https://www.urbanacitizen.com/wp-content/uploads/sites/36/2018/04/web1_Meke.jpgMeke is a four-month-old husky and yorkie mix. This adorable pup is available at Barely Used Pets. https://www.urbanacitizen.com/wp-content/uploads/sites/36/2018/04/web1_HarrietPRINT.jpgHarriet is a young tabby cat that gets along well with other felines. See her at Champaign County Animal Welfare League. https://www.urbanacitizen.com/wp-content/uploads/sites/36/2018/04/web1_MekePRINT.jpgMeke is a four-month-old husky and yorkie mix. 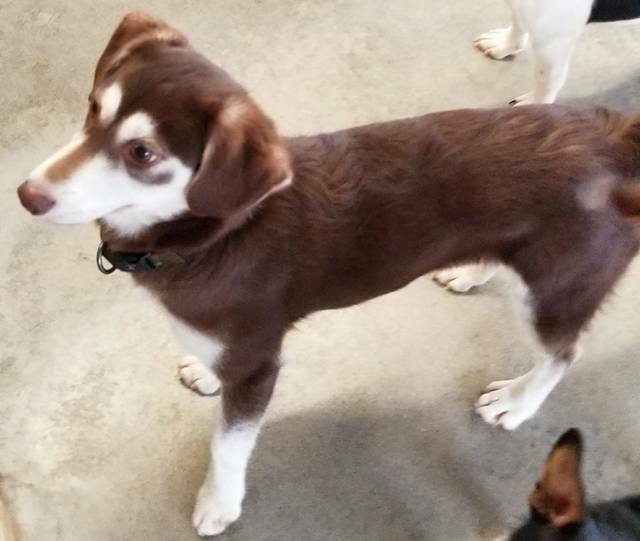 This adorable pup is available at Barely Used Pets. https://www.urbanacitizen.com/wp-content/uploads/sites/36/2018/04/web1_SueEllenPRINT.jpgSue Ellen is a young puppy mill rescue and is available at Champaign County Animal Welfare League. https://www.urbanacitizen.com/wp-content/uploads/sites/36/2018/04/web1_SueEllen.jpegSue Ellen is a young puppy mill rescue and is available at Champaign County Animal Welfare League.